Some companies who sell shower filters claim their filter will give you soft water. But in reality, a filter mainly removes chlorine and does absolutely nothing to soften water. This is why so many people who try using a shower filter alone don’t end up happy with the results it gives. To get the most relief from dry skin and hair issues you have to soften the water! To get soft water, hard water minerals such as calcium, magnesium and iron need to be removed. And the only way to achieve this in a shower is to use a salt-based ion exchange process as is used with a whole house softener and with the ShowerStick. 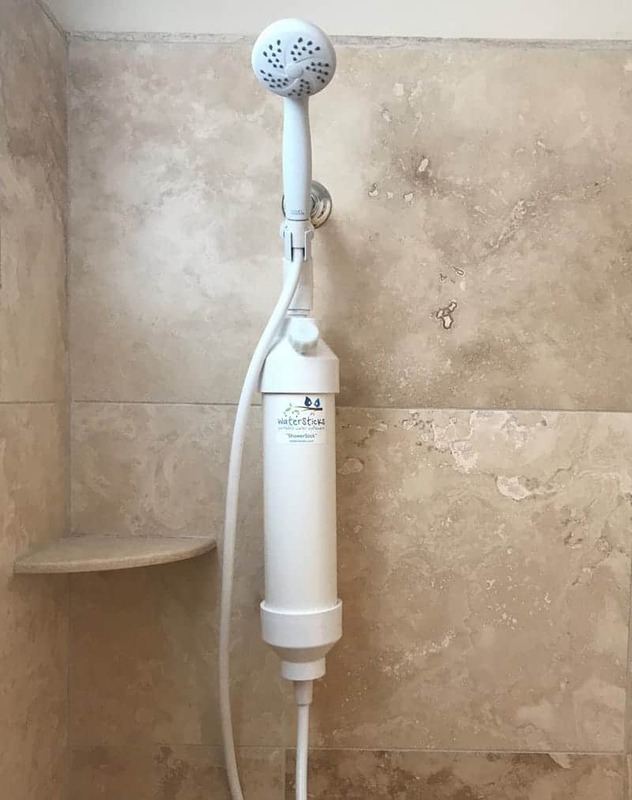 The ShowerStick is a portable shower water softener created for people who suffer with dry, brittle, straw-like hair and dry skin, eczema, dermatitis and psoriasis. It’s a great alternative for those who aren’t able to install a whole house softener. Plus, it’s portable so you can take it with you if you move. And the added bonus is that you won’t have all the hard water buildup (limescale) to scrub off from inside your shower and on your glass shower doors anymore. So, if a company says their product can in some way soften water in a shower but their product isn’t regenerated (or re-charged) with salt water, then it isn’t a “softener”, it’s a “filter”. And using a hard water test kit will show that a softener removes hard water minerals and a filter does not. ﻿WHAT’S SO BAD ABOUT CHLORINE?